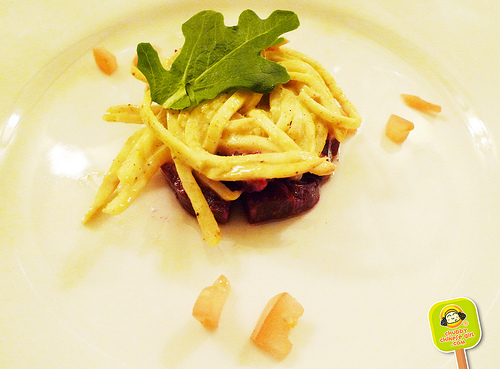 Last week I was invited to a Press Tasting Dinner at Sel et Poivre. 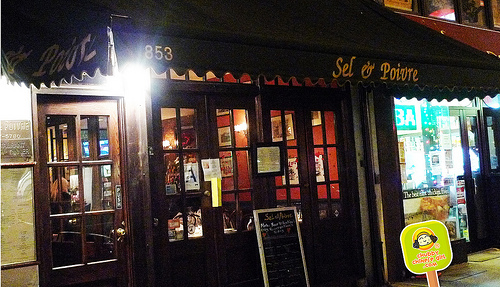 A charming little French bistro on the upper east that’s been around for over 20 years. Once a mother/daughter partnership, it’s now a husband/wife joint. I’ve walked by countless times, but never stopped to smell the butter… so this was my perfect “eatpportunity”. Joined by a group of tres fun food bloggers. Owner/Executive Chef/Sommelier Christian helped us break the ice with a glass of Prosecco, Stellina di Notte, Italy. 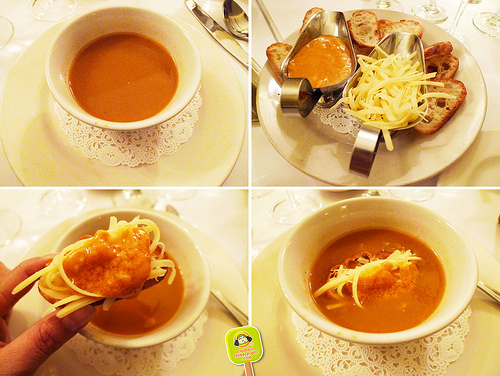 And paired each of our courses with his selections. Between Taste as you go, Fritos & Foie Gras and Gypsy-Addie (aka my new bff LOL) we ate, drank and laughed till our tummies were full and jolly. 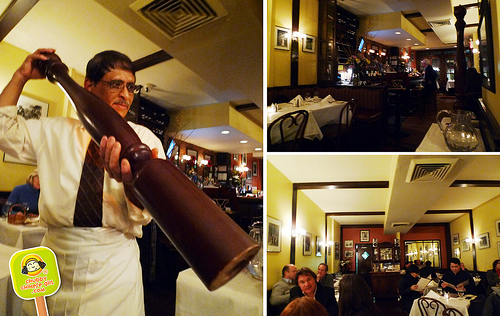 Not to mention that ginormous “poivre” mill, yes, yes, jokes were made, but those shall remain at the table *wink*. Our meal started with a red snapper based soup. Light and simple, with a hint of tomato. First taste was ok, but nothing to brag about, until the bread, cheese and garlic/saffron mayo arrived. Dunking it all in, the cheese melt and the flavors get to know each other. Deliciously playful. 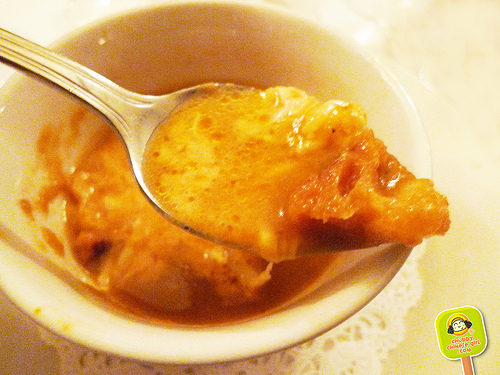 Think French Onion Soup, only replacing the onion with a delicate fish base, oozing with as much cheese as you’d like, the bread soaks up everything it comes across and that mayo just shouts garlic. Great textures and flavors. Perfect and satisfying for a cold winter night. Paired with a really really light 2008 Kremser Weinzierl, Gruner Veltliner, Austria. It went down easy like H2O, in a nice and refreshing way. Raw celery root is shaved and tossed in saffron dressing, super crisp and crunchy. Beets are sweet and tender. The flavors? Well, I never had an Indian salad, but this is how I’m guessing it would taste. Heavy hand on the saffron, overpowering the rest. Paired with a perfectly sweet 2007 Winguthimmel, Riesling Spatlese Trocken, Germany. I happen to be a big fan of skate (wing of ray), even if people tell me it’s the “garbage” fish or poor man’s fish. I enjoy its delicate white flesh and how it acts like a sponge, absorbing the right amount of sauce. Seared flawlessly. 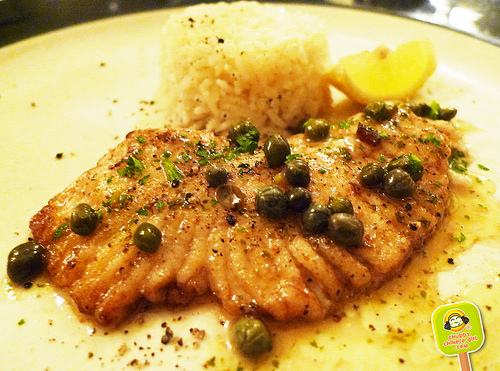 Classic flavors of fresh lemons, tangy and salty capers swimming in butter. With a side of fluffy rice. I cleaned the plate and had an extra pour of wine. Riesling always gives me a reason to say cheers. Rightfully paired with a 2007 Rosenblum Cellers Vintners Civee, Syrah. Now, when I first saw “liver” on the menu, I gasped… it transported me to that little restaurant in Paris by Sacre Coeur. Where refusing the waiter’s suggestion, I insisted on getting the “veal kidney”. When it arrived, it left nothing to the imagination, a whole organ on my plate. (That post will come soon). Anyways, back to liver, I’ve had it before and wasn’t tickled one bit. Not once have I seen it on the menu, jumped ecstatically and said “yes! liver it is”… until I’ve had them here. A little crispy around the edges and oh so tender. 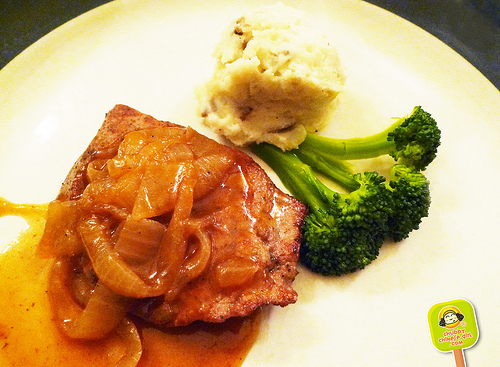 Great flavors of butter and the veal sauce with onions worked beautifully. It didn’t hide the liver taste at all, instead it dressed it up enough and the result was surprisingly un-gamey and juicy. Bien fait! Christian proudly presented it as their signature dish, one bite and I could taste why. The preparation is simple, liver is first dusted with flour and pan seared in butter (of course), topped with a brown sauce, which starts off with a veal stock (veal bones, carrots and celery cooked for hours) then browning it by adding some caramelized onions. He swears you can make this stock, freeze it in ice cube trays and use them as a base for sauces. Sounds simple enough, but I’ll leave it to the experts. This was a treat. It wasn’t on our original menu, but we welcomed it with open arms, fork and knife at hand. Hey! I’m not one to refuse steak and neither were my fellow diners. 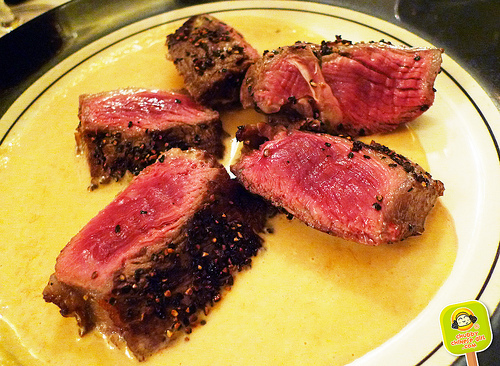 Medium rare steak topped with creamy, buttery sauce infused with cognac, bursts or more like punches of whole peppercorns all around. The carnivores in us were satisfied. 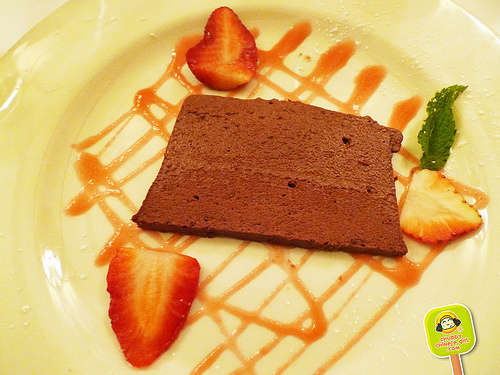 Chocolate and berries are always a great match. Specially when we ended the meal with a sweet and fragrant 2005 Chapelle St-Arnoux, Muscat “Beaumes de Venise”, France. Bites of fluffy melt in your mouth bitter sweet chocolate mixed with tart berries, washed away by a splash of honey like grapes in a glass. Life is purty sweet at this point. I couldn’t have asked for better company to share this meal with. Had a lovely night, with lovely bloggers and great food. Best of all, I found my love for liver. Who would have thought! Their liver dish would end up being the best thing I had all night. Love it when I unexpectedly discover new flavors that will forever change my perception and taste buds. To that I say “A la votre & bon appetit”! I would luv to try the Kremser Weinzierl GruVe!